For the export market, Royal Enfield already makes the Royal Enfield Classic Chrome UCE500, which isn’t too different than the erstwhile Royal Enfield Machismo with the 500cc unit construction engine. Our sources tell us that Royal Enfield has been testing the Royal Enfield Machismo 500 with the UCE engine with remapped fuel injection and that an Indian relaunch for the Machismo is likely in the coming times. If this indeed happens, Royal Enfield enthusiasts have reasons to celebrate as the Royal Enfield Machismo, with it’s generously chromed styling is one motorcycle that really has the maximum street presence when it comes to Royal Enfields. 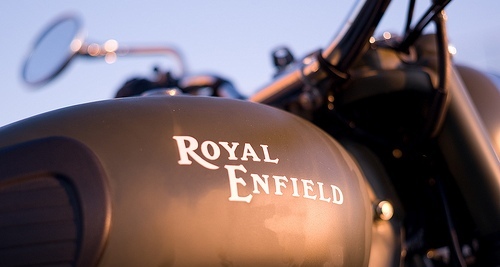 Royal Enfield has refrained from launching variants based on the 500cc UCE engine for the Indian market due to production constraints, caused primarily due to the massive demand that the UCE engined Bullets have generated in recent times. The reason for this demand is quite understandable as the Unit Construction Engines that Royal Enfield has developed in association with Engines Engineering of Italy bring tremendous improvements in both reliability, power and fuel economy. These factors allied to a strong marketing campaign by Royal Enfield has made the Bullet popular with young Indian motorcyclists, who previously avoided the Royal Enfield brand due to the high maintenance and low relaibility associated with Royal Enfield motorcycles. Coming back to the Machismo UCE500, the motorcycle could give Royal Enfield enthusiasts who plan to use their Bullets for touring a shot in the arm as the Classic 500 UCE isn’t exactly a tourer due to it’s slightly cramped ergonomics and seat design which makes it more of a city clicking motorcycle than a true blue tourer. Also, Royal Enfield has struggled to get the chassis balance right with the initial crop of Classic 500s due to the new tyre sizes, which reportedly was causing high speed handling issues. With the Machismo 500 UCE hopefully, these issues along with fuel injection glitches will be solved by Royal Enfield. With that, a credible alternate to the likes of the Honda CBR250R could emerge for those looking for a long stroke single with relaxed power delivery and vintage styling at the same price point of that of the recently launched CBR250R. What remains to be seen is how exactly Royal Enfield manages it’s delivery times which, at the current 8 months for the Classic 500 UCE is simply ridiculous for this day and age where instant gratification is the name of the game.